In this article we will spotlight on how our team has been developing the new version of Print Conductor, what kind of progress we made so far and what we are pursuing in future. But first, let's get a head start by briefly describing the program to get you up to speed. What is Print Conductor capable of? 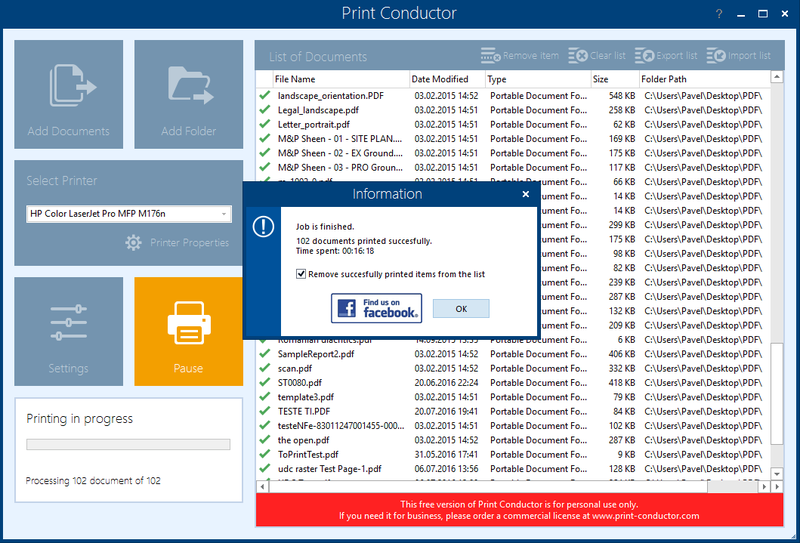 Print Conductor makes printing multiple PDF files, images and other files fast and easy. The key advantage of Print Conductor - it is extremely easy to use and it has simple design. In order to have your documents printed, all you need to do is add them to the printing list and press the ‘Start Printing’ button. In 9 out of 10 cases you won’t need to change the default settings - the documents will be properly printed out. Who would use Print Conductor? Print Conductor is commonly used in offices and organizations with intense document flow, such as construction and real estate companies, account departments, law firms, insurance companies, banks, post-offices, medical centers, and other institutions. Users who print other types of files: Open Office, TXT, HTML, JPEG, PNG, TIFF, XML, MHT, CSV, Microsoft Outlook MSG and EML, etc. During the development process of Print Conductor 5.2 we made a range of improvements for all these 4 groups of users. We mainly focused on users from group 1, because, according to our data, printing PDF files is the most relevant and popular feature. Print job size (RAM memory of a printer and local office network capacity are not unlimited). In order to meet the mentioned criteria and to significantly improve the overall performance, we needed an effective PDF library component. For 2 months we have been analyzing several commercial libraries for PDF format processing. While analyzing the market of commercial components for PDF format processing we came to a conclusion, that part of these products are focused on enterprise-level integration only. They either didn’t have the necessary OEM license in their price list, or the price turned out to be extremely high. For instance, one of famous PDF libraries OEM license was at the cost of $160 000 a year! Many components comprise a set of features for PDF files manipulation: digital signatures, pages adding and replacement, etc., but lacked the needed feature to print PDF documents. As a result, we decided on AbcPDF component. We spent 2 months to test it and integrate it to Print Conductor. The developers of AbcPDF willingly solve issues and fix defects, found during our tests. It was one of the reasons we picked on this component. "Internal-New" method is used in Print Conductor 5.2 by default, as in 95% of cases it works perfect for batch printing of PDF files. "Internal-New" method is based on AbcPDF component. It exports Adobe PDF file pages into Enhanced Metafile format and prints them via GDI+ library, which is built-in in Microsoft Windows system. Print quality of "Internal-New" method is significantly higher than “Internal-Old” method quality. Moreover, "Internal-New" method provides higher quality for some PDF files compared to those printed by Adobe Acrobat Pro 11, which we used as a quality benchmark for PDF batch printing. It is unable to print password protected PDF files. For those reasons above, "External" printing method is also considered as additional. Below are the results of comparison tests of the three printing methods described. The tests were made by printing of 102 various PDF files using each method. *Print quality was evaluated by visual comparison of documents printed by trial version of Adobe Acrobat Pro 11 and those printed by Print Conductor 5.2. **Trial version of Adobe Acrobat Pro 11 was used to test “External” printing method. The workstation used for the tests have the following configuration: CPU Intel Core i5-760 2.8 GHz, 16GB RAM, HDD ST2000DX001 with 64-bit Microsoft Windows 10 installed. The print server workstation was based on CPU Intel Core i5-4460 3.2 GHz, 8 GB RAM, HDD ST2000DX001 with 64-bit Microsoft Windows 8 installed, and connected to HP Color LaserJet Pro MFP M176 printer. During the tests we measured the Print Conductor’s runtime by sending the collection of files to the print server. We also evaluated the size of the print job (Mb) on print server. 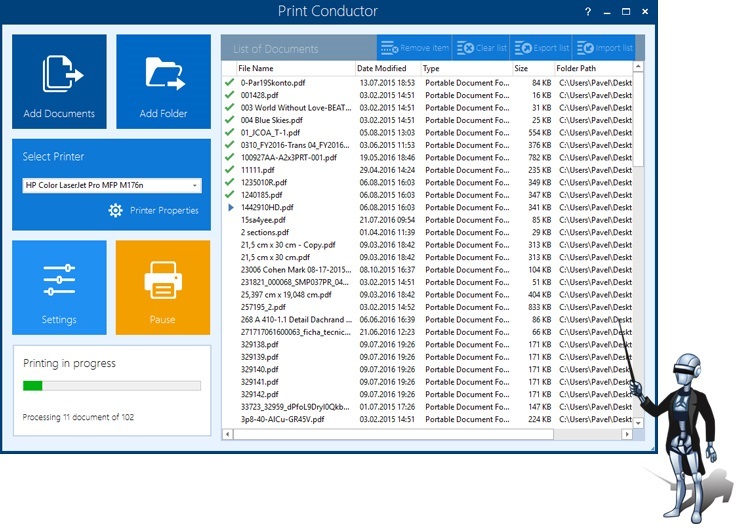 Print Conductor software can automate printing of PDF files using the default settings on any up-to-date PC and printer. "Internal-New" printing method, which is used in Print Conductor by default, uses a lot of computing resources at the initial stage, when the document pages are prepared to be sent to the printer. It seems to be the penalty for very high print quality and more than twice less traffic load on printer memory and office local network. The program can optionally convert and merge all documents into one multipage PDF file and send it to printer. This feature is useful for processing many documents. Printing multiple documents is faster this way, because the printer does not waste time on switching between different files. Moreover, the documents will appear in the printer output tray in the very same sequence as in the Print Conductor printing queue regardless of printer settings or Windows print service settings. Great advantage here: your documents will be printed out in bulk, even if several users are using a network printer simultaneously! A set of several documents can be printed in duplex mode. It is useful, if you, for example, want to print 10 three-page documents, which are to be printed no gap on both sides of paper sheets (without blank pages). If you have 10 one-page documents, only 5 sheets of paper will be used. Thus, your printing will be more eco-friendly by saving extra paper. Without combining documents within one print job, each document will be printed in duplex mode separately. Before starting a print job a pre-print report will pop-up, showing how many sheets of paper is needed for each document. You will also see the overall number of sheets of paper necessary. This feature is relevant, for example, for visitors of shops or internet cafes with pay-per-page system. PDF Portfolio format is a nice and compact container of different types of files: images, text files, audio and video clips. In the new version of Print Conductor we managed to correct defects and avoid distortion for PDF Portfolio elements. A PDF document sealed with a digital certificate may contain a visible text or image watermark. If printing goes without certificate validation, a yellow question mark may appear on the watermark element. To avoid it, we implemented automatic certificate validation in Print Conductor. A useful feature to keep the pages of printed copies of documents in order. In the new version you can select printer tray manually or let Print Conductor automatically choose paper source by PDF page size for you. This feature allows you to print password protected PDF files without any dialog pop-ups, requiring to input password. You can set one password for all documents or a list of passwords from a text file. To start the printing process you don’t need to extract the files first - you’ll just add an archive to the printing list along with other documents. Different processing methods provide maximum compatibility of the most complex documents with any type of printer. If you print Searchable PDF documents (which allow to find and copy pieces of text) in text mode on a virtual printer, such as Adobe PDF or Universal Document Converter, the output PDF file will be searchable as well. Collation of output documents by pages or by documents. Three types of PDF page scaling: “Fit to page", “Shrink" and “Print as is"
In the future versions of Print Conductor we are going to implement a new method of PDF printing, which will provide higher print speed and image quality. "Internal-New" method will convert a PDF file into page layout in Microsoft XPS format, depending on fit and scale options made by user: page alignment and page rotation, scaling, etc. Then the XPS file will be sent to printer via NET Framework 4.0 library components. Today this method is used in Print Conductor as an additional pilot method of printing. This method performs very fast, and the print quality excels the quality of “Internal-New” method. In order to set this method as primary for printing PDF files, we need to solve certain issues with processing non-standard (JCK characters, special symbols, etc.) fonts and characters.